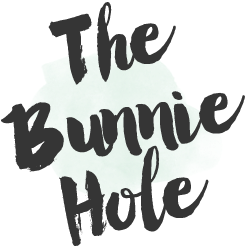 Today's product review is close and dear to my heart because I have been using this item (in its various incarnations) for nearly a decade and it is still a well loved piece in my makeup collection. The colour was Santa Rose and it was Rimmel's Lasting Finish Blush, my very first cheek colour and it is something that still brings nostalgic memories every time I pass by it in the store. Would I repurchase: Yes, already have and likely always will. Rimmel's single blushers have come a long way since I first saw them in their small brush-less, removable lid containers more than 6 years ago and for the longest time they were the only blushers I owned in my collection. They initially caught my eye because of the wearable shade selection and the affordable price which (when on sale) is actually one of the lowest you can find in the drugstore here. And it was probably a good thing that I started off with these Rimmel blushers because they are so easy to wear (and let me tell you blush can be a dangerous tool in the hands of a beginner). The current look for these blushers include a clear flip top lid and small brush, in a convenient to hold but slim size. While the brush is a bit scratchy (as most drugstore ones tend to be) it does the job efficiently, diffuses the product evenly and I have no qualms about using it when I'm in a rush to get going. 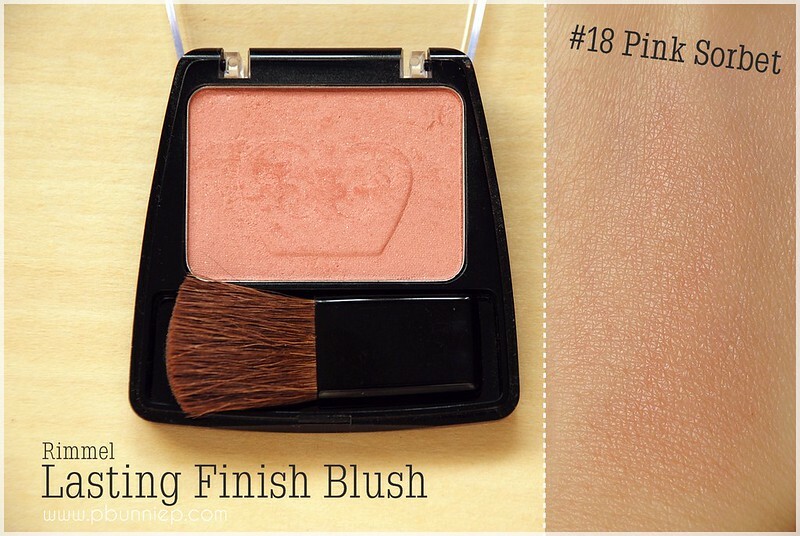 The texture of the blush is rather dry though it is neither chalky nor powdery. When putting a finger to the pan you can feel the small bits of shimmer in the product but fret not it blends effortlessly onto the cheeks. I believe all the mono blushers have a semi-matte to satin finish which actually looks quite sophisticated and brings a bright youthfulness to the face. Of the 2-3 shades I've used over the years, the colour payoff appears to be quite consistent, right between light to medium and can easily be worn sheer making this a very easy to use products even for beginners. 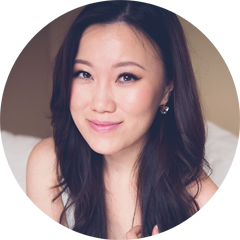 The colour in Pink Sorbet (above) is one that I use frequently on those neutral makeup days because it plays up my complexion nicely without being over the top bright, more of a demure peachy pink rather than my usual loud Dollywink blush. 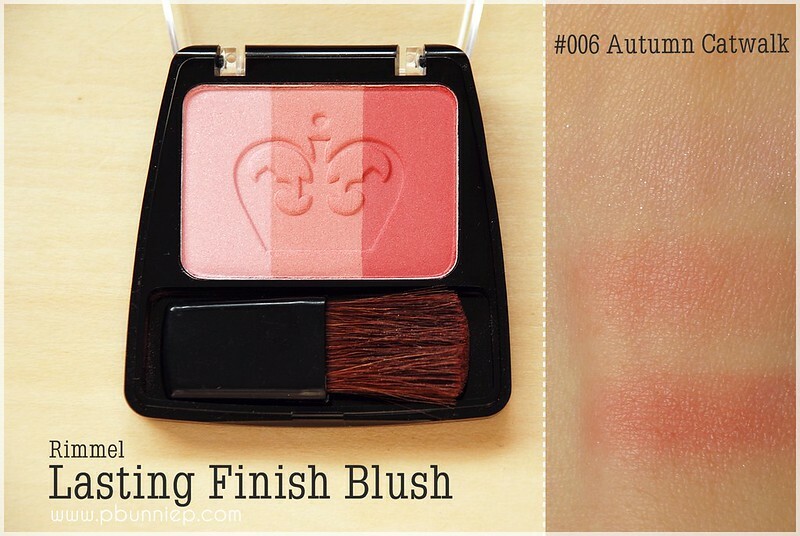 A newer addition to my collection, I've noticed two Lasting Finish Blush trios available at select drugstores (this one is from Walmart, USA), a deeper mauve berry and also a juicy pink named Autum Catwalk (above). The shimmer is much more noticeable in this variation, with the highlighting pink coming off as mostly sparkle with very little colour payoff so use this strip cautiously. For this pan, I tend to use the two darker shades or just swirl everything together. I can see the trios being a favourite for younger gals looking to experiment with fun shimmer and sparkles but those looking for a more sophisticated look should stick with the mono blush shades. The quite fabulous thing about these blushers is their wear time (they don't call these Lasting Finish for nothing), they have never played hid and seek with me and I can just pop them on once in the morning, know that they will still be around by the late afternoon. While they will not stay perfectly immaculate, they will serve you well through a regular school or work day without any fuss. 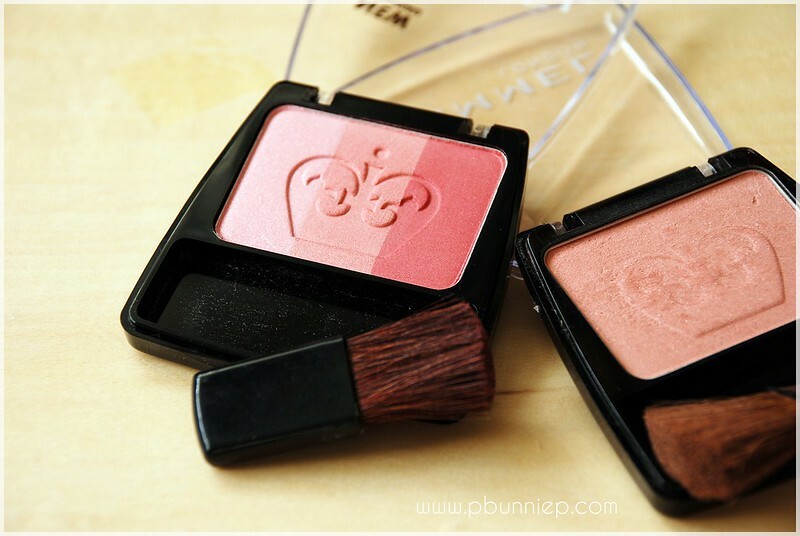 In fact they were my favourite blushers to use during my university years because it was just reliable. Even better none of the shades I've used have ever turned or oxidized on my face which might be a winning point for those with oilier skin. 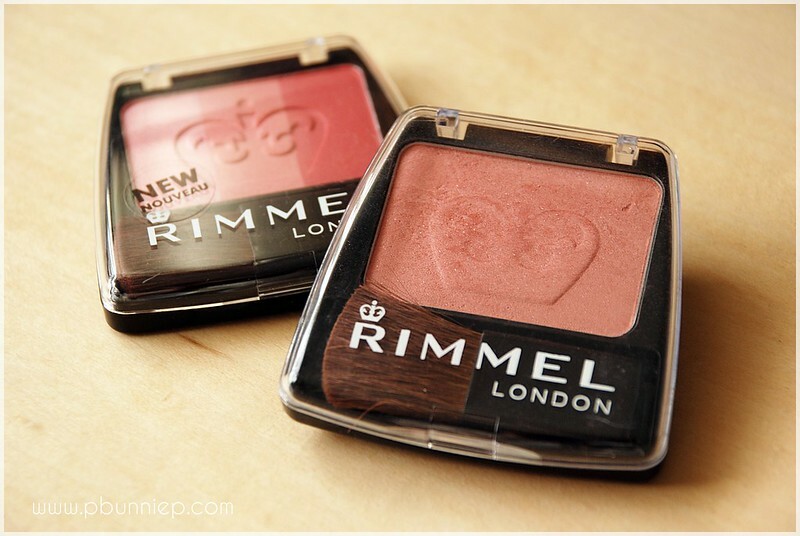 There are many things to love about these blushers and I hope that Rimmel will always keep them around. The universally pretty neutral colours, the long lasting effects and even the fact that it's unfragranced will make these a hit for anyone seeking an affordable blusher to fill their small (or big) makeup collection. Had no idea these blushes would swatch so well! I'll have to check them out! 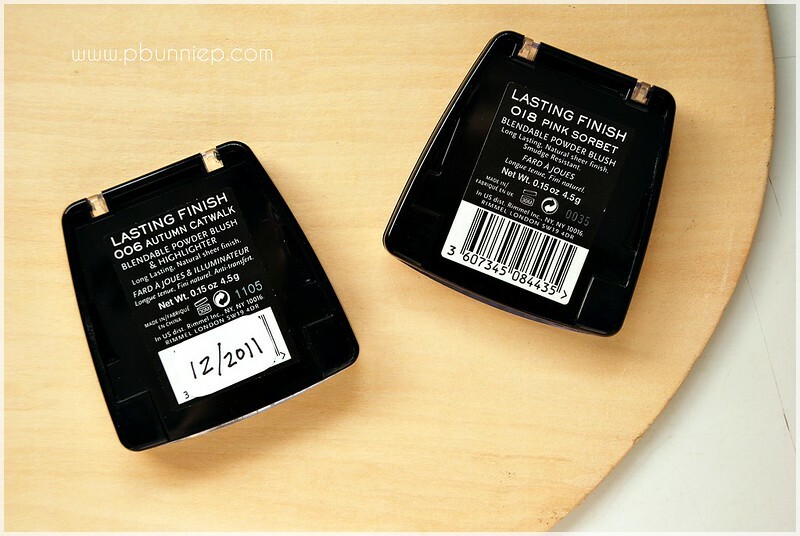 Thank you for the swatches and review, I noticed that you've labeled when you started using/bought them :D Thats a good way to keep track of how old a particular item is or lasts!